Its amazing to think summer is almost over, school is starting and the college football season is quickly approaching. The Huskers first game against Western Kentucky is only two weeks away and Pelini has the team workin' hard in pre-season practice. So dust off your Big Red duds and get ready to gather at our favorite watch sites to cheer on our team for their last season in the Big 12. Lots of good stuff below to get you in the football spirit, and some other great articles about whats going on in other Husker sports and Lincoln. And there's a great Randy York article at the end about a special surprise Suh gave every player at the beginning of summer camp. Enjoy! The first two non-conference games will be broadcast on PPV so we'll be passing the hat at Legends, Jack's and Final-Final to help these great establishments defray the $400 cost to pay for the broadcast. If everyone chips in ten bucks we should be able to cover the bill. The Western Kentucky game on September 4th starts at 4 p.m. Pacific Time (yup...its a night game in Lincoln), and the Idaho game on September 11th is a morning game with kickoff at 9:30 a.m. Pacific Time. We're checking with our 3 main watchsites (see www.BayAreaHuskers.org for more info and directions to all of our watch sites) to confirm they will pay for the games. Those on the Husker News email list will receive another email before each game to let you know. Here is the link to sign up for Husker News. Huskers could be, for this year anyway, America 's team. them they could take their personal conference and shove it. A lot of people really like Nebraska 's new "Pluckiness". trophy home with them as an adios gift. beaten by Nebraska after they toyed with them and then decided to stay. make their conference appear to be stronger. The SEC would love to see the Huskers take down that conference. will certainly have a lot of new support in hoping it happens. Everyone has an opinion about Nebraska football in 2010, and former Michigan and NFL quarterback Brian Griese offered his Tuesday on ESPN College Football Live. Asked to go "on the clock" and analyze Nebraska through its 12-game regular-season schedule after the Huskers lost three games by five total points in 2009, Griese was bullish about the Big Red challenging for a national championship. Acknowledging that Bo Pelini had "brought back the workmanlike attitude at Nebraska," Griese predicted an 11-1 season for the Huskers and another likely appearance in the Big 12 championship game at Cowboy Stadium in Arlington, Tex. Griese asked his College Football Live audience an interesting question during his game-by-game analysis. "Are we going to have a Red Out Across the World or across the globe ... is that what we're going to have?" he said before predicting a Husker win over the Longhorns in Lincoln on Oct. 16. He envisions Nebraska winning that showdown because of its stifling defense and a superior kicking game. Beating Texas, he added, will create a "red out all over the place." While Griese sees a 10-0 start "and everybody talking Nebraska", he forecasts a spoiler on Nov. 20 at Kyle Field in College Station where he predicts Texas A&M will end NU's perfect season with the help of its fabled "12th Man" fans. To watch Griese's analysis, click the link above. Nebraska fans have a chance to express their own opinions on how their favorite team will fare in a 12-game regular season. You can cast your vote in the Fan Poll, located below the Nebraska Ticket section on the left-hand side of Huskers.com. Lincoln- The Nebraska Football team practiced for two hours in full pads Tuesday inside of the Hawks Championship Center. After the practice, Offensive Coordinator Shawn Watson spoke on the current quarterback situation. "This is a big week for the guys," Watson said. "This is a week where we are putting the guys through situational things in terms of the game of football. The competitions have been really close and I feel like we have gotten much better. They've all done well and have been able to manage the aspects of the offense." Watson also spoke on the good play that the wide receivers have been showing during fall camp. "They've really shown improvement," Watson said. "Niles (Paul) continues to up his game. (Brandon Kinnie) is probably the guy that has really come the farthest. He really started evolving last year into a really good football player and he has really continued that and is chasing (Paul). They've been really good for each other. Mike McNeill also continues to make plays. I feel really good about those guys." If you use this networking system, click on the link and sign up today! Husker fans are known for traveling well in support of Nebraska's football team, and with today's launch of the "Red Out Around the World" website, Big Red fans can show their team spirit and connections to Husker Nation wherever they are. The website lets fans plot their location on a world map and see how many other fans are in all 50 states and every country on the globe. Fans also can use the site to access other fans' Red Out Tweets and Flickr photos and read Facebook updates and stories from campus. "The goal of Red Out Around the World is to connect, celebrate and salute Husker fans across the globe for their unparalleled support," Nebraska Athletic Director Tom Osborne said. "We want to showcase the depth and breadth of support from Nebraska football fans and give them a way to connect with each other and the Athletic Department." This is the first-ever attempt at a coordinated worldwide Red Out - calling on all fans to wear red on game day in the stadium, at watch parties and at home or wherever they are in the world. Nebraska Athletics led the effort and is working in collaboration with University of Nebraska Communications, the Omaha World-Herald and the Nebraska Alumni Association. "While we look forward to the worldwide Sea of Red on Oct. 16 with great anticipation, it's important to note that we will use this theme all season long as we recognize our fans across the globe for their support of the Huskers," said Nebraska Assistant Athletic Director Michael Stephens. "I'm sure the energy that millions of Husker fans can produce will support the team throughout the schedule." The focus is engaging and energizing fans and giving them opportunities to win prizes. Beyond providing the chance to see the global reach of Husker spirit, the site offers participants one daily prize beginning today through Oct. 16. Each participant on the global map has a chance to win the grand prize that will be awarded on Oct. 2: two tickets to the Nebraska vs. Texas football game, plus a two-night stay at the Holiday Inn Lincoln-Downtown. 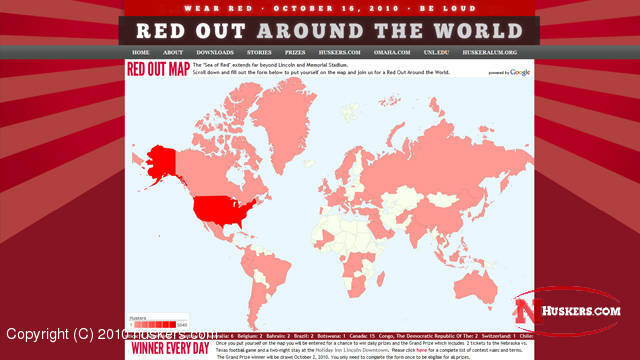 If you're excited about Nebraska's long awaited Red Out Around the World website complementing Huskers.com, you're in good company. Nebraska Athletic Director Tom Osborne Tuesday night admitted that he, too, was eagerly anticipating the collaborative website sponsored by Nebraska Athletics, the University of Nebraska-Lincoln, the Nebraska Alumni Association and the Omaha World-Herald, which published a story Tuesday about how the webset will bring Big Red fans closer together through a wide variety of social networking. When Husker Sports Nightly Host Lane Grindle told Osborne Tuesday night on the Tom Osborne Radio Show that he liked the interactive map and the website's ability to communicate with Husker fans around the world, Osborne credited Nebraska's Marketing Department for pulling together the aggressive project. "I've always been amazed at how far flung Nebraska fans are and how loyal they really are," Osborne said, adding that the popularity of Nebraska football watch sites across the country and around the world helped fuel the desire to showcase Big Red fans for the Nebraska-Texas game Oct. 16 in Memorial Stadium. Osborne said NU's Marketing Department selected the Texas game last winter because it was the most likely game to be on national television, not because there was any intention "to put Texas in a bulls-eye." The Red Out game asks fans to wear red and be loud, and the website is designed for two main reasons: 1) to connect Big Red fans everywhere; and 2) to celebrate tradition (Nebraska's first national championship team in 1970 will be honored at the Nebraska-Texas game). One American soldier got a jump-start on the Red Out action, sending a photo that a buddy took of him holding a Big Red flag on an airstrip "somewhere in Iraq." 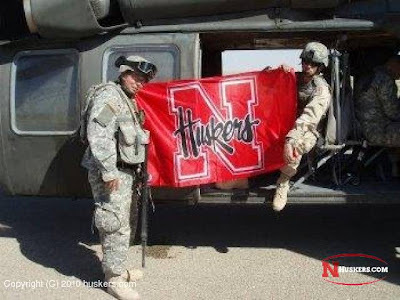 "This flag has been with me all over the world," Michael Slagle wrote in an email to Huskers.com. "It was bought by my grandfather in Arizona and went with me everywhere while on deployments." Slagle says the flag that carries a soft spot in his heart "is now hanging on the wall in my sister's bar in Central Nebraska." Nebraska fans worldwide are encouraged to put themselves on the map, to share photos and to register to win prizes on Red Out Around the World.com. Senior Alex Henery continued Nebraska’s impressive haul of individual preseason accolades on Friday, when he was one of 30 players named to the 2010 Lou Groza Award watch list. The Lou Groza Award is presented annually to the nation’s most outstanding place-kicker, and Henery was a semifinalist for the award last fall. A 2010 preseason All-American, Henery set a Nebraska record with 24 field goals in 2009 while earning second-team All-Big 12 honors from the league’s coaches and the Associated Press. In his career, Henery has made 50-of-57 field goals (.877), including 47-of-49 (.959) inside 50 yards. Henery is also 139-of-140 on career extra-point tries. He owns the Nebraska and Memorial Stadium record for longest field goal (57 yards against Colorado in 2008) and his 289 career points entering 2010 rank fifth on the Nebraska career chart. Henery has totaled 110 points each of the past two seasons, good for eighth on the Husker single-season list. A third 100-point season this fall would move Henery to the top of Nebraska’s career scoring list. He has also already tied an NCAA record with six career games with four or more field goals. Senior wide receiver Niles Paul was one of 51 players named to the 2010 Biletnikoff Award watch list, announced on Tuesday. Paul was one of three wideouts from the Big 12 Conference to earn preliminary consideration for the award, which is presented annually to the nation’s most outstanding receiver. As a junior last fall, Paul led NU with 40 receptions. He averaged 19.9 yards per catch, an average that ranked third in school history among players with at least 20 receptions. Paul hauled in four touchdown catches and also added scores on the ground and via a punt return. He posted two of Nebraska’s all-time top 10 receiving games with 154 yards at Kansas (fourth) and 143 yards against Iowa State (ninth). Paul finished the year with the fifth-best receiving total (796 yards) in Husker history. In his career, Paul has hauled in 64 catches for 1,016 yards. He needs only eight receptions and 141 yards to move into the Nebraska career top 10 in each category. Paul is also an accomplished return man, having taken both a kickoff and punt return for touchdowns. His 27.9-yard kickoff return average in 2009 ranked second in the Big 12 and was the best by a Husker in two decades. His 10.7 yards per punt return also ranked second in the league. Semifinalists for the Biletnikoff Award will be announced on Nov. 15, with finalists selected on Nov. 22. The winner of the 2010 Biletnikoff Award will be announced on Dec. 9 during the ESPN College Football Awards Show. An all-conference selection a year ago as both a receiver and punt returner, Paul’s appointment to the Biletnikoff Award watch list continues an impressive list of preseason accolades for the Huskers. Senior Roy Helu Jr. was named to the Maxwell Award (college football player of the year) watch list on Monday, while senior Prince Amukamara and junior Jared Crick were both named to the Chuck Bednarik Award (college defensive player of the year) and Bronko Nagurski Trophy (most outstanding defensive player) watch list. Amukamara also earned a spot on the Jim Thorpe Award (nation’s most outstanding defensive back) watch list, while Crick was named the Big 12’s preseason co-Defensive Player of the Year and was on the Outland Trophy (nation’s most outstanding interior lineman) watch list. He was also named to the Walter Camp Player of the Year watch list. Husker Sports Network, the multimedia rights partner of the University of Nebraska Athletic Department, has announced a partnership extension with News Radio 1110 KFAB that will keep Nebraska Cornhusker football on the powerful Omaha station through at least 2014. "Aligning with a radio station known for its strong presence in Omaha and across the region is important to University of Nebraska Athletics," Nebraska Athletic Director Tom Osborne said. "We appreciate KFAB's commitment to supporting the Cornhuskers and are delighted to continue our long and historic bond. Nebraska football Saturdays on KFAB are a great part of our state's culture." David Witty, general manager of the Husker Sports Network, said: "Husker Sports Network is proud to continue its excellence in radio broadcasting by extending this partnership. KFAB's signal and history with the Huskers are important to Big Red fans, and we're proud to continue this relationship for listeners in the Omaha area." In addition to football, the extension will allow Nebraska men's basketball to remain on KFAB through the 2014-15 seasons, and men's baseball through the 2015 season. Clear Channel's KTWI-FM will continue as NU's Omaha outlet for volleyball and women's basketball. "The University of Nebraska and KFAB have a longstanding relationship dating back to the 1920s," said Taylor Walet, general manager of KFAB. "This is more than a business deal for us. The Huskers are part of the family. We are thrilled to continue this partnership with the University and Dave's team at the Husker Network." The new agreement with Husker Sports Network, an IMG College property, began July 1, 2010 and will continue until June 30, 2015. for men's basketball and baseball. Lincoln - A strong class of 21 Husker student-athletes earned their bachelor's degrees from the University of Nebraska during summer commencement exercises at the Bob Devaney Sports Center last Saturday morning. A pair of current Nebraska football players - Mike McNeill and Mike Smith - both earned their undergraduate degrees as marketing majors while participating in NU's fall camp heading into their senior seasons for Coach Bo Pelini. Two starters from Coach Doc Sadler's men's basketball program also earned their degrees, as 2010 seniors Ryan Anderson and Sek Henry will both graduate. Coach Chuck Chmelka's men's gymnastics team features the most summer graduates, with Adrion Hernandez, Tony Maras, John Robinson and Josh Rusler, all collecting their diplomas on Saturday morning. Coach Rhonda Revelle's Nebraska softball team added three graduates (Crystal Gonzalez, Alex Hupp, Brittany Pascale), as did Coach Gary Pepin's track and field squad (Jack Lemke, Robert Rands, Danielle Anderson). Coach John Walker's NU soccer program added a pair of graduates (McKensie Kirchner, Brittany Pfeil), as did Coach Pablo Morales' swimming and diving program (Kelsey Ida, Audrey Kruse) and Morgan Hicks' rifle team (Christine Costello, Amanda Jeffries). Coach Mike Anderson's Husker baseball team added former pitcher and Lincoln native Brian Rodaway to the list of graduates. The Husker graduating class provides an exciting mixture of student-athletes who came from near and far to call Nebraska home during their collegiate careers. Nebraska's 2010 May graduates came to Nebraska from 14 states, while also featuring six Nebraska natives. The summer graduating class of 21 is added to NU's 70 May graduates and 37 December graduates to bring the total number of Husker student-athletes graduating during the 2009-10 academic year to 128. Nebraska continues to feature one of the highest graduation rates in the nation with an exhausted eligibility graduation rate of 94 percent, while leading the nation in the number of CoSIDA Academic All-Americans (277) and NCAA Top Eight Award winners (16) across all sports. All-American Peaches James will become the fourth Husker softball player to have her number permanently retired, when her No. 42 jersey is officially retired on Saturday, Oct. 2 during Nebraska’s doubleheader against an all-star team from the National ProFastpitch league. James will join All-Americans Lori Sippel (No. 16) and Denise Day (No. 10) and fellow Nebraska native Julie Geis (No. 15) as the only Huskers to have their number retired. Head Coach Rhonda Revelle also announced that three-time All-American Ali Viola will become the fifth member of that elite group. Viola is currently the associate head coach at Ohio State and Nebraska plans to officially retire her No. 2 jersey when the Buckeyes travel to Lincoln for a to-be-determined Big Ten Conference matchup during either the 2012 or 2013 season. “When I first got the phone call from (Associate Head Coach Lori) Sippel, I couldn’t even speak for a second,” James said. “I never saw this coming or even knew it was a possibility. I am just so humbled to have my jersey retired. To have it hanging there next to those three amazing ladies is just breathtaking. A graduate of Papillion-LaVista High School, James enjoyed a decorated four-year career at Nebraska from 2001 to 2004. James was a four-time, first-team All-Big 12 selection, becoming the first pitcher to earn four first-team honors in league history. During a stellar senior season in 2004, James was named a second-team NFCA All-American in addition to being named Big 12 Player of the Year and Big 12 Tournament MVP. James was also a three-time Big 12 all-tournament team selection, a six-time Big 12 Pitcher-of-the-Week honoree and earned one Big 12 Player-of-the-Week honor. On the national level, James was a three-time NFCA National Player-of-the-Week selection and was one of 25 finalists for the USA Softball Collegiate Player of the Year award in 2002 and 2004. She was also a first-team NFCA All-Region selection in 2003 and 2004 and a second-team honoree in 2002. In her career, James boasted a 98-38 record with a 1.19 ERA and 945 strikeouts in 917.1 innings. She threw 44 shutouts, including three no-hitters, and tossed one of only three perfect games in Nebraska history. James is the Nebraska career record holder in strikeouts and shutouts, while ranking second in wins, innings pitched, no-hitters and complete games (101), fifth in ERA and saves (9) and sixth in winning percentage (.721). In earning All-America honors as a senior, James posted a 37-9 record with a 0.70 ERA in 298.1 innings. She tossed a school-record 18 shutouts and struck out a school-record 394 batters, while opponents hit only .137 against her. In addition to her school-record strikeout and shutout totals, James posted the second-highest win total in Nebraska history that season, while also ranking second in innings pitched and complete games (39) and seventh with an .804 winning percentage. James’ 0.70 ERA in 2004 stands as the lowest at Nebraska since 1987 and is good for seventh in the Husker record book. James also owns a spot on Nebraska’s single-season top-10 lists in wins (23, t-9th in 2003), innings (243.2, t-7th in 2003 and 227.0, 10th in 2002), strikeouts (250, 7th in 2003), shutouts (nine, t-9th in both 2002 and 2003), saves (four, t-7th in 2002) and complete games (27, t-6th in 2003). James also routinely hit for herself, finishing with a .224 average in 554 career at bats. James batted .280 with nine home runs and 37 RBIs in 2002 and finished her career with 124 hits, 63 runs scored, 16 doubles, 14 homers, 76 RBIs and 24 stolen bases. “I am so proud and feel so blessed to have had the opportunity to play for Nebraska,” James said. “It was the best four years of my life and helped me grow so much as a person and a player. The Huskers enjoyed terrific team success during James’ career, winning three Big 12 championships (two regular-season crowns and one tournament title) while winning 13 games in the NCAA Tournament, including a fifth-place finish at the 2002 Women’s College World Series. Overall, Nebraska never finished a season ranked lower than 14th during James’ career, while posting three of the top five season win totals in the 35-year history of the program. But despite the on-field success, James was quick to point out that she learned much more in her time at Nebraska than just softball. While James was quick to give credit to the coaching staff, Revelle said James has earned this prestigious honor. "Peaches James is one of those people that you absolutely feel honored to coach,” Revelle said. “You are her biggest fan because she is such an extraordinary human being. Gifted, humble, dedicated to the Nebraska’ name on her jersey, spirited, competitive, team oriented and immensely grateful for her talent and the opportunities that made this day possible. “Although I am still trying to take all this in, there are a ton of people who have made this possible. I am grateful to so many people, I don’t know how to honor everyone without making this a book, but I am going to try. “First of all I have to thank all of my teammates throughout the years for your hard work and dedication. There is no me without you. To my coaches, you have helped me build my foundation and develop my skills. I want to especially thank Coach Revelle, Coach Sippel and Nebraska Softball for presenting me with this amazing honor. “I don’t think I can say thank you enough to all my catchers. Sometimes you don’t receive enough recognition, but I have always believed that a catcher is what makes a good pitcher great. You get up early with the pitchers and stay late when we have to keep working. You are selfless day-in and day-out and you brought out of me what I didn’t know I had. “To my friends, I want to give you a special thanks because you have been my strength throughout my life. You have been there with me, even if it wasn’t your duty. I cannot count how many selfless acts you have done to help me be a better player and person. “Mom, Dad and the rest of my family, I love you so much. You have been my rock and support system. You were there in every aspect of my life that I needed you. I simply cannot say thank you enough. This honor is as much yours as it is mine. Lincoln - The Nebraska volleyball team will enter the 2010 season ranked second in the AVCA Coaches Poll, which was released Tuesday afternoon. The Huskers (1,384 points) were one of three teams to receive first place votes, as No. 1 Penn State tallied the most at 40, while Nebraska was second with 16 and No. 3 Texas snagged four votes. The Huskers welcome back a strong team in 2010 that only lost one starter from a 2009 squad that was fifth in the final AVCA poll. Nebraska finished the year with a 26-7 record and made a trip to the NCAA Regional round for the 16th straight season. Individually, the Huskers return three players who have earned AVCA All-America honors during their careers in the scarlet and cream, including two-time All-America setter Sydney Anderson (2008-09), senior outside hitter Tara Mueller and junior middle blocker Brooke Delano. Anderson and Delano, along with senior Kayla Banwarth and sophomore Hannah Werth, were all selected to the preseason All-Big 12 team last week, while the Huskers received nine-of-11 first-place votes in the conference team poll. The rest of the preseason top 10 was rounded out by No. 4 Stanford, No. 5 Hawai'i, T-No.6 Illinois, T-No. 6 Minnesota, No. 8 Washington, No. 9 Iowa State and No. 10 Southern Cal. Nebraska, Texas and Iowa State were the only Big 12 teams to crack the top 25. Nebraska and Stanford have been the two most consistent teams in the AVCA's 400 all-time polls, as each has been ranked in every poll dating back to 1982. Nebraska's 81 weeks in the No. 1 spot is still tops on the list, while Penn State sits second at 64 weeks. When it comes to being ranked in the top-10, Stanford holds a one-week advantage over the Huskers, 367-366. Along with two Big 12 matches each against No. 3 Texas and No. 9 Iowa State, the Huskers will face four other opponents in 2010 that enter the season ranked in the top 25. Nebraska will have a tough test early during the Runza/AVCA Showcase at the Qwest Center in Omaha on when it takes on No. 14 Kentucky on Saturday, Aug. 28 and then faces No. 13 Florida the following day. Two more ranked foes will then be in Lincoln for the Ameritas Players Challenge on Sept. 9-11, as the Huskers will face No. 21 Dayton on Thursday, Sept. 9 at the NU Coliseum and No. 6 Illinois on Saturday, Sept 11 at the Devaney Center. Fans will have their first opportunity to see the Huskers at the Red/White Scrimmage on Saturday, Aug. 21, at 7 p.m.
Lincoln - The 2010 Runza/AVCA College Volleyball Showcase will again be broadcast nationally on CBS College Sports Network. The event will take place August 28-29 at Qwest Center Omaha and will feature two teams from the Big 12 Conference, Iowa State and Nebraska, as well as two teams from the Southeastern Conference (SEC), Florida and Kentucky. In the second year of the "conference challenge" format, Florida and Iowa State will go head-to-head in the Showcase's first match, set for 2 p.m. on Aug. 28, with Kentucky and Nebraska proceeding at 4:30. The following afternoon, Iowa State and Kentucky will joust at 2 p.m., and Nebraska will face Florida at 4:30. Along with the national broadcast on CBS College Sports Network, the 2010 Runza/AVCA Showcase will be shown regionally on NET, who will be producing the event. The Nebraska soccer team opens its 16th season in program history this Sunday when the Huskers travel south to take on New Mexico. The season opener for both teams will begin at 1 p.m. CST from the UNM Soccer Complex in Albuquerque, N.M. Live stats will be provided on www.golobos.com. Nebraska returns nine starters off last season's team that went 11-5-4 overall and finished fourth in the Big 12 Conference (5-3-2). The Huskers ranked third in the NCAA with 3.10 goals per game in 2009, the highest scoring average by a Nebraska team since 2000 (4.0). This year's squad looks to be led by the returning 2009 Big 12 Offensive Player of the Year, Morgan Marlborough, a sophomore forward from Lee's Summit, Mo. Nebraska also brings back two-time All-Big 12 selection Molly Thomas, a junior midfielder/forward from Omaha, Neb. As underclassmen in 2009, the duo combined for 29 of the team's 63 goals. In all, the Huskers return 70 percent of its goals (43-of-62) from last season. As Nebraska begins its 16th season in program history, the same is true for head coach John Walker. Since 1994, Walker has become one of the most successful collegiate coaches in the nation with a 236-91-21 career record. He enters the 2010 season with the 13th-highest all-time winning percentage in the NCAA, as the Huskers have won 70.8 percent of their matches under Walker. He is also 18th in victories among active coaches. Following this weekend, the Huskers return for the home opener Aug. 27 against Loyola University at 5 p.m. Earlier next week, fans will have an opportunity to meet the 2010 NU soccer team at the annual "Meet-N-Beat the Huskers." This year's event takes place Wednesday, Aug. 25 at the Nebraska Soccer Field from 6:30-8 p.m. The Nebraska Alumni Association, the University of Nebraska–Lincoln and the official Nebraska Alumni ROTC affiliate group would like to invite you to an ROTC alumni weekend celebration. The weekend includes a preview of the newly renovated Pershing Military and Naval Science Building lobby, a Football Friday celebration at the Wick Alumni Center, a social hour at the Nebraska Champions Club and a Saturday watch site for the Nebraska vs. Kansas game. Admission: $15 (includes buffet and 1 raffle ticket). Payment required in advance. Please plan accordingly for lodging needs. There are several hotels in the downtown area within walking distance to campus and the stadium. Public parking is available throughout the area, or you can reserve a garage space at one of the many public parking garages. For information on parking reservations, please call City of Lincoln parking services at (402) 441-6472. Shuttle service will be provided Friday between events, if necessary. Check HuskerAlum.org for more information. Stop by the Wick Alumni Center for the Nebraska Alumni Association's Football Fridays when you’re in town this fall. Before each home game, a panel of former players and local media members preview the upcoming game and answer audience questions about the Huskers. Weekly giveaways include game tickets, Champions Club passes, Husker memorabilia and more. The events are free and open to the public. Doors open at 4:30 p.m., and the program begins at 5:30 p.m. The first Football Friday of 2010 is Sept. 3, featuring former Huskers Tommie Frazier and Matt Davison, and Assistant Athletic Director for Football Operations Jeff Jamrog. View the complete 2010 schedule. Welcome three new alumni chapters! Please join the NAA in congratulating these chapters, and extend a Big Red welcome to their presidents and members! The Nebraska Alumni Association and the University of Nebraska–Lincoln will host a "Celebrate Nebraska" reception Feb. 10, 2011 for all of our alumni, fans and friends in California. Special guests include: Chancellor Harvey Perlman, Coach Bo Pelini, former Husker players Tommie Frazier and Matt Davison, and more. If you're in the area, make plans to join us at the Hyatt Regency-Irvine, 17900 Jamboree Road, Irvine, CA, for an evening celebration featuring taste of Nebraska foods from Valentino's, Runza and Dorothy Lynch. A pre-event golf tourney starts that day at approximately noon. Registration begins Oct. 18. Check the alumni website for more details about the event as they become available. Show your support for the Nebraska Alumni Association and connect with UNL alumni across the country through the Big Red Business Clubs. Joining is easy and starts for as little as $250 a year for exposure on the alumni association's website and publications. Additional packages include enhanced marketing opportunities for your products and services, Husker tailgate hospitality, Nebraska Champions Club passes, meet-and-greet events with Husker legends and more. To learn more, visit HuskerAlum.org, or contact Bob Stelter (402-472-4246). Put your name on the waiting list for information about the Nebraska Alumni Association's future Big Ten football ticket and travel packages for alumni and fans! Trips will be determined once the 2011 Big Ten football schedule is announced, and demand will be high. Send your name and e-mail address to Jenny Green (put "Big Ten travel" in the subject line), and you will be among the first to know as details become available! In the meantime, learn more about potential future destinations on our website. Entertain your group or company at the Nebraska Champions Club this fall with a Husker Hospitality Package (two versions available). Each package includes parking, pedestrian passes and use of a tent. Reserve multiple packages in one season, or purchase multiple packages over several years, and receive a discount. A limited number of packages remain for the 2010 season, so contact Bob Stelter today. Now you can order your favorite UNL Dairy Store treats online. A campus tradition for Nebraska students and alumni since 1917, the Dairy Store is the first occupant of the UNL Marketplace, a unified online shopping mall for campus storefronts. The marketplace has been developed to provide all UNL organizational areas with a single infrastructure for online transactions, integrated into the UNL website. More stores will be launching on the marketplace soon. The UNL College of Journalism and Mass Communications is creating a news site about refugee communities in Lincoln as part of a grant it received to launch a community news project. UNL is one of nine community news projects selected from across the United States as this year's New Voices grant winners announced by J-Lab: The Institute for Interactive Journalism. UNL is eligible to receive $17,000 in the first year to launch its project and $8,000 in matching support in the second year. Read more. The University of Nebraska–Lincoln has announced the awarding of nearly 1,500 scholarships to 2010 Nebraska high school graduates. The total potential value of the scholarships is more than $12 million. The awards are comprised of 25 Chancellor's Scholarships, 350 Regents Scholarships (including 117 Nebraska Top Scholars), 51 Nebraska Achievement Scholarships, 90 David Distinguished Scholarships, 797 James H. Canfield Scholarships, 64 Chancellor's Leadership Class scholarships and 34 Pepsi Scholarships. Learn more. The benefits of accountability, ingenuity and integrity are displayed daily by Nebraska farmers and athletes. On the field or in the fields, Nebraska athletes and farmers share values, a bond and a commitment to hard work, statewide pride and national leadership. That's why Nebraska Athletic Director Tom Osborne on Friday announced the creation of Cornhusker Co-Op - a new fundraising partnership between Nebraska Athletics and farmers. "Working together, we think we can take our athletic department to a higher level," Osborne said, "There's a healthy respect for what athletes and farmers are required to do every year to be successful, so we believe with some teamwork and some trust, we can produce a partnership that will be truly unique." With agreements between Nebraska Athletics and large grain elevators in Aurora, Dorchester and York - and other local elevators that will be announced - managers are authorized to designate portions of a farmer's grain yield as a donation to Nebraska's Athletic Department. The key to making the arrangement work is important to all athletic and agricultural success - keeping things fairly simple and fundamentally sound. "Cornhusker Co-Op is designed to be successful largely because it represents the character and the word of everyone involved," Nebraska Development Officer Mike Dobbs said. "The system is so simple, the only thing the local farmer needs after driving up to the local grain elevator is to designate what portion of that particular harvest will go to Nebraska Athletics." Using an existing account at a trusted business makes contributing to Nebraska Athletics hassle-free, according to Dobbs, who is working with Co-Ops and farmers to broaden the program across the state. "We appreciate the support from Nebraska farmers," Dobbs said, "and we've earmarked various forms of recognition from the Athletic Department to give something back - from decals and special hats to facility tours and picnics. We see this partnership as an extension to our athletic family." In addition to most Nebraska farmers anticipating a record crop in 2010, Husker athletic teams have set their sights on lofty achievements. Dobbs sees a certain irony to the likelihood of an early harvest of bountiful Nebraska crops at the same time the Huskers begin their journeys to their ultimate destinations - conference or national championships. "We hope that farmers who share parts of their good fortune with Nebraska Athletics will encourage and rally others to contribute to the same cause," Dobbs said. "Nebraska Athletics, in turn, will prosper and recognize the farmers who show their unity and support." In his roles as a head football coach, U.S. Congressman and now as Nebraska's athletic director, Osborne never has been surprised at what his home state can accomplish when it has a vision and works with others to meet its goals. "Nebraska farmers have a great work ethic and ingenuity," Osborne said. "They've always shown why our athletic teams represent Nebraska values more than we represent anything else, so I'm looking forward to growing our future together. I see our farmers across this state as solid partners as we take on new challenges and set new goals." 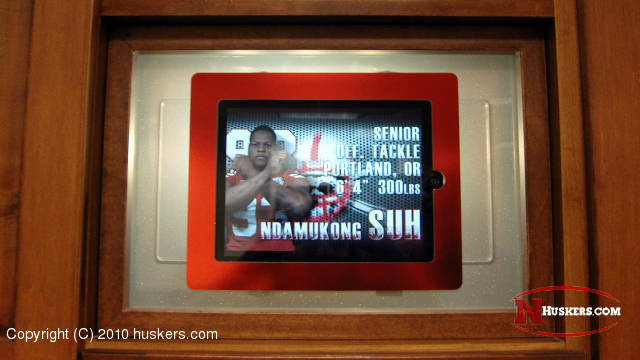 When Nebraska recruited Ndamukong Suh, one thing that really captivated a serious pre-engineering student from Portland, Ore., was a mock-up of what players' lockers might look like in a future locker room. It wasn't his name or his picture that charmed Big Suh. It was the computer that would be built in to the top of his locker. Well, the technological sweet spot of reliability and affordability never materialized, and Suh never forgot. So, in a perfectly timed coincidence, two hours after Suh was announced Friday as the 2009-10 Big 12 Conference Male Athlete of the Year, Nebraska shut down its varsity football locker room and began taking off 123 back-lit nameplates. Beginning Monday, thanks to Suh, that chunk of space will be replaced with 123 built-in Apple iPads - the popular touch-screen computers that fill the gap between a laptop and a smart phone and are the ultimate manifestation of four decades of clever technology. Just four months after the celebrated worldwide launch of iPads, Nebraska believes it is the first collegiate or pro football team to equip its players with at least some benefits of the technology. After unveiling his Suh90.com "House of Spears" website (with a heavy Husker flavor) on Friday, Suh seemed just as happy to hear the iPad-in-every-Husker-locker news as he was gaining yet another individual honor. "It's great to see the things you envision come to pass," he said. "Originally, we were supposed to get something similar in 2006, but they never came. The technology wasn't quite there yet. We ended up having still photos with our information on it on the big screens, but nothing of this caliber or with this high level of interaction." Nebraska Athletic Director Tom Osborne admitted Friday that he didn't know a lot about iPads, "but the main purpose," he said, "is for communication, so if Bo (Pelini) or an assistant coach needs to schedule a meeting, everybody can know immediately, whether they're in the varsity locker room or the walk-on locker room at the Hawks Championship Center. To be efficient, we need to have everyone on the same system." For compliance reasons, the iPads will be mounted into each player's locker. The football staff will have the ability to send messages to the players via their iPads. The players will be able to acknowledge and respond, but their messages will be limited to football and academic personnel only. Maggi Thorne, Nebraska's Assistant Director of Capital Planning and Construction, will manage next week's iPad installation. She says the varsity and walk-on locker rooms now have the wireless infrastructure to accommodate the new technology and points out that all 37 walk-on lockers in the Hawks will be equipped with iPads by the end of August. The new capability will enable the football staff to post events to each player's iPad calendar, so he will know the times of each practice, conditioning session, academic meeting or position meeting, even if it's called at the last minute. Yes, technology is reinforcing Bo's mantra to focus on the process and compete hard every day. New school efficiency meets old school work ethic. Who would have thought that team-assigned iPads would become a staple of each Husker player's daily routine and ease the burden of the grind? Screen savers will become their new nameplates, and like toys that come to life in movies, each locker will come to life whenever the time is appropriate. Connectivity is designed to bring a close team even closer. Having video-on-demand and the wireless ability to upload new videos and photos in the locker room not only should enrich the journey, but also evolve into new ways to inspire the ones taking it. Imagine, if you will, a recruit visiting Nebraska the day before, during or after Game Day. He walks into the locker room and sees 123 high-definition computer screens near the top of each locker with each player's name, number, year and position. There's a certain power in a live screen saver, and there will be a central control that will allow each iPad to transform itself into a myriad of applications that can be as individual or as collective as the IT person is told to designate. What about the capability to access all iPads remotely so they can play the same video at once? "Wireless can cause a slight delay, but yes, that's the plan - to get all to play at once when the situation calls for it," said Chad Chiesa, a Nebraska Athletic Department IT specialist. "With the assistance of a software development firm that specializes in mobile device applications, our hope is to keep everything in sync." Think about that for a few seconds. Picture a recruit stepping into the Huskers' locker room for the first time and seeing the lights dim while 123 iPads come on with a recap of Jared Crick's biggest hits, Prince Amukamara's pivotal interception, Niles Paul's acrobatic catch or Alex Henery's dramatic field goal. "There could be some really big wows for recruiting," said Jeff Jamrog, Nebraska's Assistant Athletic Director for Football Operations. "We're using the iPads primarily to communicate more efficiently and more effectively, but there's no doubt they can become a recruiting edge. I think that's why Ndamukong wanted to get these iPads installed so quickly. He likes to be different than everyone else, and he showed where he's coming from when he made one of the biggest contributions in college athletic history." John Ingram, Nebraska's Associate Athletic Director for Capital Planning and Construction, says he knows of at least three Division 1 schools that either have tried or thought about using computers in lockers, but they squelched the idea because of server problems, systems issues or inadequate funding. "One school (on the West Coast) put them in and had to take them out because they were more problems than they were worth," Ingram said. One school's problems, though, became another's innovation. Ingram huddled up with Thorne and Nebraska's Information Technology team -- including Dan Floyd, its director, and Chiesa -- to discuss the opportunities and challenges of executing Suh's dream for current and future Huskers. "We had every intention of installing computers four years ago, but we couldn't find a system that wasn't cumbersome or cost prohibitive," Ingram said. During a brainstorming session, iPads were mentioned as a more viable alternative. "All of us just looked at each other and nodded our heads," Ingram said. "We were thinking the same thing: 'Why not?'" An interesting thing happened on the way to that solution. The prospect for reliability went way up while the costs went way down. "Computers really were part of the original plan," Ingram said, "but they were much more expensive to buy, install and maintain, and when one computer would go down, they would all go down." Not so with iPads. "We not only cut our costs by about two-thirds, but the reliability factor went straight north," Floyd said. "If one iPad breaks down, you fix it or replace it. One problem iPad doesn't affect the other 122 around it." Isn't it amazing how simplicity can be the capstone to both affordability and performance? Next Saturday, when Nebraska football players report for Fan Day to kick off fall camp, Suh hopes to be signed and in training camp with the Detroit Lions. Thanks to his generosity, his former Husker teammates will have another benefit to enjoy - a 14½-foot by 9-foot polar tank that was recently installed to rest weary bones after a hard practice, lifting session or game. "The Whirlpool we had in the locker room was difficult to fill up with ice, so we jack-hammered it up and replaced it with one that everyone can appreciate," Ingram said of the new polar tank. "It's like putting an ice bag on your whole body." At Nebraska, information and therapy are a package deal. Once you submerge your aches and pains in the 55-degree tub, you'll be able to watch Sports Center on two 65-inch, high-def TVs. Yes, Suh had teammates in mind when he made the decision to finance the improvement. "The polar tub will be an essential addition," he said, "because it will help with the recovery process during preseason camp and keep body maintenance during the season." And here's what Big Suh really likes. "The new design will allow for much easier access versus what we had before," he said. Prospective recruits may not say "wow" when they see the polar tank, but Suh knows his ex-teammates will, and they'll appreciate the comfort coming from the House of Spears. A polar tank and 160 iPads are a good start on the Suh legacy, but stay tuned. There is so much more to come. "A big part of Damo is the Husker that's still in him, and that's why Nebraska is a big part of his new website" says Ndamukong's sister, Ngum Suh. "So many athletes, when they go pro, only have their professional acknowledgement. My brother is one of the few, if not the only one, to show such appreciation for and give attention to his alma mater." When you view Suh's fast-and-fun website, make sure you click the Nebraska logo "N" and check out his "Husker Locker Room". Once you see the way he embraces his roots, even in the privacy of your home, you might just decide to yell "Suhhhhhhh" one last time before the season starts. I have a block of tickets for the Nebraska/Washington game scheduled for September 18th. These tickets are in the visitor section (section 8) and are priced at $150 per ticket, plus shipping costs of approximately $12 per order for UPS or FedEx. I am selling minimum pairs, and have up to 10 seats together for groups. I am making this offer available to Husker contacts directly through the first part of next week, prior to listing these tickets on Stubhub on Tuesday, August 10th. Stubhub service adds a number of transaction fees, which will increase the ticket cost by approximately $50 per seat. If you have questions are or are interested in ordering tickets for this game, please contact me by email at brad@nwtravel.com.